With the continued advancements in data exchange and the ever changing regulatory requirements, healthcare CIO’s are increasingly faced with the challenges of interoperability and Health information exchange. When it comes to tight and seamless integration, exchanging data with local and state information exchanges is one of the greatest challenges a healthcare organization IT team faces. At Summit Healthcare, we possess more than just excellent products and services. We provide a relationship and solutions to assist you in solving the myriad of technical integration obstacles that your organization faces on a daily and ongoing basis as you become ever more connected with the greater healthcare community. Since 1999, Summit Healthcare has been at the cutting edge of healthcare IT products and services, and we have worked side-by-side with countless healthcare IT teams to tackle these challenges. We take immense pride in our stellar record of simple and elegant solutions to every integration need we encounter. 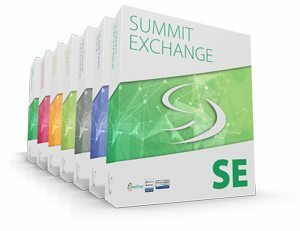 Our clients find maximum value in leveraging the Summit Interoperability platform with the Summit Exchange interface engine as a solid foundation for data exchange. Summit Exchange is a full-featured interface engine that allows centralized dashboard management of all of your interface engines, including to HIEs. It is Drummond Group ONC-ACB EHR 2015 Edition Certified for Meaningful Use and Ranked in KLAS® for interface engines. You will have no problem with data transfer and interfacing with HIEs using Summit Exchange. See how Summit Healthcare’s solutions helped Boulder Community Hospital maximize functionality of their data exchange project with the State of Colorado, and see how we can help your team today!